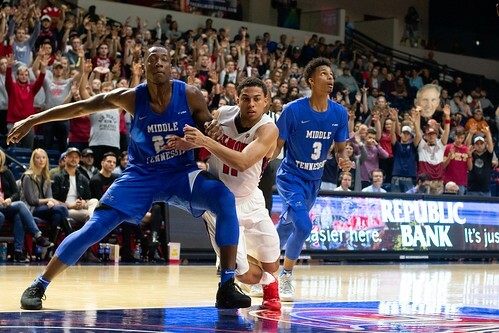 After trailing at halftime, the Belmont men’s basketball team came back and defeated Middle Tennessee State University 92-73. The Bruins had a rough first half, missing six 3-point attempts in the first 11 minutes. The Blue Raiders took advantage of Belmont’s missed shots and led 54-46 at the end of the first half. It didn’t take long after the beginning of the second half for Belmont to run away with the game. The team scored 46 points with the help of senior Dylan Windler and freshmen Nick Muszynski and Grayson Murphy. Windler had an explosive second half, earning a double-double with 34 points and 11 rebounds. Murphy also played a major role in the victory, with 15 points, seven rebounds, eight assists and five steals. Muszynski scored 18 points in his second start this season. He also showed dominance on defense with three blocks and two turnovers. The Bruins are now 2-0 as they get ready for a difficult game against cross-town rival Lipscomb University. Belmont will face the Bisons at Allen Arena on Thursday at 6:30 p.m.. This article written by Steven Boero. Photos by Carina Eudy.